This was a good episode in terms of elaborating on exactly what Hannibal Lecter's (Mads Mikkelsen) long-term goal is with criminal profiler Will Graham (Hugh Dancy). It's not solely a twisted friendship or a fascination with how Will's mind works; it appears Lecter is hoping to guide Will down a path of transformation, moulding him into also becoming a killer. This idea was nicely reflected in the case-of-the-week, where the BAU team were investigating a spate of murders that bear the hallmarks of animal attacks. Only Will realises the culprit's actually a man who imagines himself to be a beast, which later leads them to natural history museum worker Randall Tier (Mark O'Brien)—an ex-patient of Lecter's who suffers from an identity disorder and has built an "animal suit" that includes a prehistoric bear skull with pneumatic teeth. It appears Randall's psychosis was helped along by Lecter when he was a teen, now transforming him into a serial killer in his twenties. As Will surmised to Lecter, how many others have there been? We know Lecter likes to help killers evade justice (which also happens here when he tips Randall off about the FBI), but I hadn't really considered he's breeding lunatics from his office. "Shiizakana" also saw Will meet Margot Verger (Katharine Isabelle), the lesbian twin sister of the yet-unseen meat-packing magnate Mason Verger. 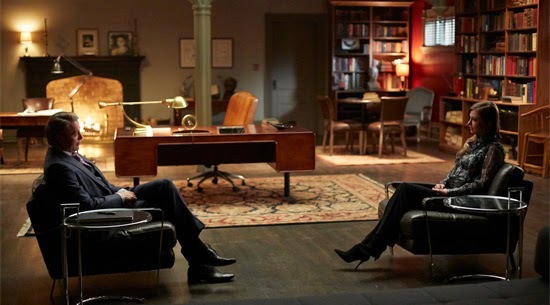 She's quite rightly curious about why her psychiatrist Dr Lecter encouraged her to try killing her sicko brother again, and it was fun to see two of Lecter's patients "comparing notes". It was a good reminder of exactly how clever Lecter's chosen professional is as a cover, because patients aren't usually likely to talk to one another, and he's bound by doctor-patient confidentiality a lot of the time. I thought this episode was decent, enough despite the fact the central idea of a museum worker scurrying around town wearing an animal exo-skeleton was perhaps the silliest thing Hannibal's writers have come up with. It worked well as a theme, but I just didn't buy into the idea someone would ever do this. The suit just looked too restrictive and ungainly, although director Michael Rymer did what he could within the limitation so it never looked completely dumb on screen. However, the thrust of the episode worked well regarding the polite antagonism between Lecter and Will. 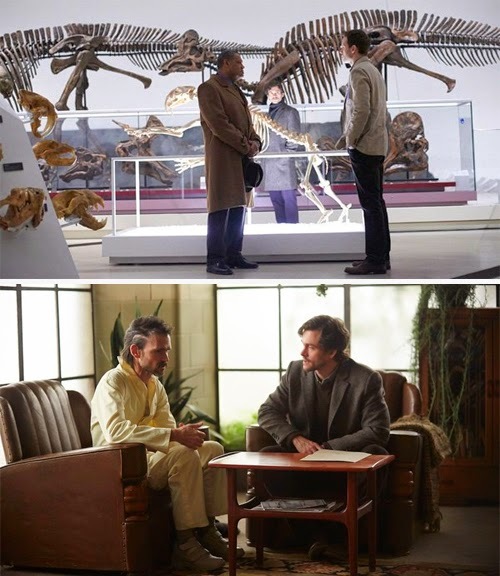 It's fascinating to watch their interactions this season, now Will knows his shrink's a murderer. Lecter occasionally lowers his guard and answers a pointed question honestly, and yet there's always enough doubt in the meaning behind it. He's not quite ready to come clean about his activities, although Will clearly desires this more than anything (as the excellent teaser showed, with Will dreaming of tying Lecter to a tree wrapped in ropes that were being tightened by the feathered-stag that haunts him). The episode ended on a big moment, too. Will killing Randall, who was encouraged to kill him by Lecter, and depositing the body on Lecter's dinner table. They're now even (having both tried to kill the other by proxy), sure, but is Lecter successfully grooming Will because now he's been forced to kill and perhaps feel powerful? I doubt it. I think Will's plan is to make Lecter think he's more psychologically malleable than he really is, and is just trying to give Lecter a feeling of false security so he'll be more honest with him.